Galganov's Recipe for the Fun, Pizza Roll! Firmer toppings (such as bell pepper should be cut in strips rather than cubes or squares. Remember; Everything must roll in without piercing the dough. Using a rolling pin, form the crust as a rectangle (or square) so it can be rolled up evenly. Minimum size should be about 7" (18 cm) x 10" (25 cm) - 1/4" (5 mm) thick. Sprinkle any herbs or other seasonings over the surface. Spread a thin layer of shredded mozzarella evenly accross the surface. Sprinkle some grated parmesan on top of that. Scatter olive pieces around the top. Roll carefully into a long roll stopping just short of rolling up dry end. Pull the dry end up and pinch, tightly, to the dough. If needed, use Warm Water to lightly dampen a thin strip along the end to help the dough stick as you pinch the seam closed. Carefully pinch the ends as well. Place your Pizza Roll - seam up - on the hot pizza stone (or on a cookie sheet and into the hot oven). Bake until the dough is dry and a bit crispy. The seam may break open and that's okay. Tap the exposed dough to see if it is "toasting". Too baked yields a crust that could be hard on the gums. Pizza Tip: A little olive oil spread over the face of the dougn before dressing is very nice and will help protect the dough, a little, from getting soggy from the sauce. We like to use strained tomato with herbs added after the sauce is applied to the surface. It brings a nice, fresh taste. Since we started making our own crusts, the entire pizza adventure has changed ... from toppings to presentation. The covered pizza is certainly a favourite around here. We've all rolled up a small pizza (and some of us, larger than plate-size) and just eaten it. 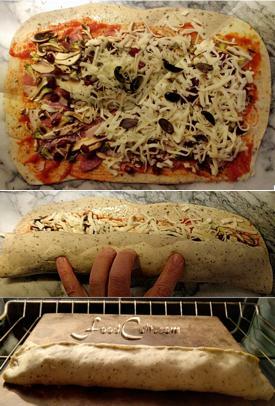 Well, this Pizza Roll delivers just that (the rolled up pizza) but less mess. The Pizza Roll (also known, sometimes, as a Pizza Roll Up or Stromboli) is, simply, pizza - rolled and then baked. One may dress it with one's favourite pizza toppings. Bake it seam side up (since the seam will likely pop and that, at least, keeps the juices in the roll. This pizza meal bakes, as with most pizzas, directly on a stone (or on a pan) on the bottom shelf of the oven ... but I like to bake it at a slightly lower heat ... just to give the insides time to heat and cook before the outside gets too crispy.